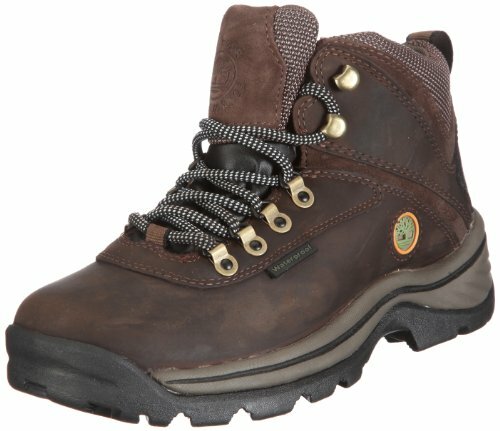 List of the Most Comfortable, Waterproof, Durable Hiking Shoes to Protect Your Feet. Are you searching for the best hiking shoes? There is nothing like being out on the hiking trail in a pair of reliable, durable, long-lasting hiking shoes that can endure the various obstacles you are likely to experience. When you are comfortable and protected, you can spend less time worrying and more time soaking in the beauty and magnificence of the entire experience. If you are looking for the best hiking shoes, then you have come to the right place. The days of searching endlessly for a reliable pair of men or women’s hiking shoes only to be disappointed by the quality and durability of them once they are put to the test are over. Through our extensive quest, searching through hundreds of hiking shoes (all waterproof too), we have finally compiled a list of the top ten best hiking shoes for sale on the market today. We tediously have put each waterproof hiking boot under observation, checking each one for all of the factors that make up an ideal pair. Whether you plan to go for a short day hike on wet terrain or plan to go backpacking in an area where rain is a high probability, it is essential to have a pair of waterproof hiking shoes you can trust. In this review guide, you will learn exactly how to decipher which pair is best for you and come away with a pair you can trust on your next hiking adventure. The differences between the best hiking shoes and a pair made of lower quality can be subtle and hard to notice if you do not know the right features to check and considerations to make. Best hiking shoes for men - Hiking shoes for men are designed slightly differently than for women. From the fit to the style to the movement they allow, these hiking shoes are ideal for male hikers. Best hiking shoes for women - Women hiking shoes are designed to fit and allow for maximum comfort. Check these four pairs of the best hiking shoes for women out now and find the right pair for your next adventure. Best hiking shoes for snow - There is nothing worse than your feet being cold while hiking. Whether it is raining in cold conditions or you are trekking through snow, these hiking shoes can keep you comfortable and warm. Although each pair of hiking shoes in this review guide are sure to perform well, it is important to note that merely because one pair may have better reviews does not necessarily mean it is right for you. Be sure to take your own needs and preferences - along with the specifics of how you plan to use your hiking shoes - under consideration before making your final decision. The quality of your hiking shoes can dictate the quality of your overall experience. Stay safe, comfortable and ready to tackle any obstacle with any of these four pairs of hiking shoes for men. The Timberland Men's White Ledge Hiking Shoes are one of the most popular pairs currently on the market, and they are incredibly successful at keeping your feet dry when hiking in wet conditions. The key to their success is the high-quality material and their incredible design, which keeps water out and allows for excellent traction. One of the most significant advantages of the Timberland Men's White Ledge Hiking Shoes is the full-grain leather. The leather is highly resistant to water, and this hiking boot consists of 100% leather. Additionally, it provides excellent traction even in wet conditions, so you do not have to worry about slipping in falling when going across wet rocks or marching through a shallow river. Perhaps the only downside to the Timberland Men’s White Ledge is that it can be somewhat heavy to those who prefer a lightweight hiking boot. While the full-grain leather provides excellent durability and is water-resistant, it is heavier than synthetic or split-grain leather options. The Timberland Men’s White Ledge is a true all-around hiking boot that is perfect for any hiking adventure, regardless of the conditions or the length of the trip. It is well reviewed and trusted among thousands that currently use them as the go-to hiking boot. With color options, you can find a pair that you think is attractive and, most importantly, stay safe during your next hike. Columbia is one of the most popular brands in the hiking industry, and the Columbia Men's Buxton Peak is one of their best hiking shoes for sale. It provides extreme comfort, excellent durability and is entirely water resistant. It comes in three different style options, and they are fashionable enough to wear daily. The Columbia Men's Buxton Peak provides excellent traction so that you can tackle even the toughest terrains with ease. Whether it is scaling a large mountain or trekking through snow, they can handle the challenge effortlessly. Additionally, they are more lightweight than the normal waterproof hiking boot, which many find make them more comfortable to wear while hiking. The material used to construct the Columbia Men's Buxton Peak may not be as durable as various other options, although there is no reason to doubt it will last for a long time before it needs replacement. However, if you plan to go on week-long hiking trips regularly, then a full-grain leather pair may be more suitable. Made of suede leather, the Columbia Men's Buxton Peak is undoubtedly one of the best waterproof hiking shoes for sale today. It is very versatile and can be used on some of the toughest hikes or wear daily. 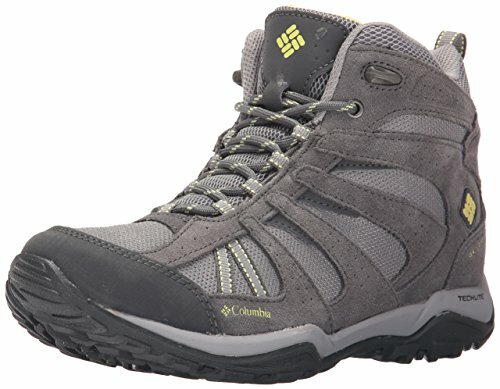 This hiking boot by Columbia provides excellent comfort, excellent traction and is very stylish, and it is sure not to disappoint regardless of your exact purpose. 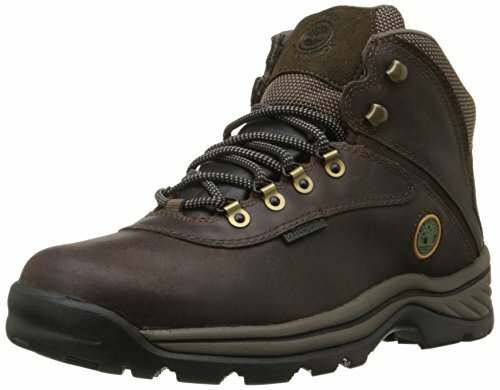 Merrell Men's Accentor is a unique waterproof hiking boot in a sense it is not 100% leather. It consists of a combination of leather and textile material, which allows it to be water-resistant while still maintaining a lightweight and comfortable nature. It is a great all-around hiking boot that is perfect for daily use or long hiking trips in wet conditions. 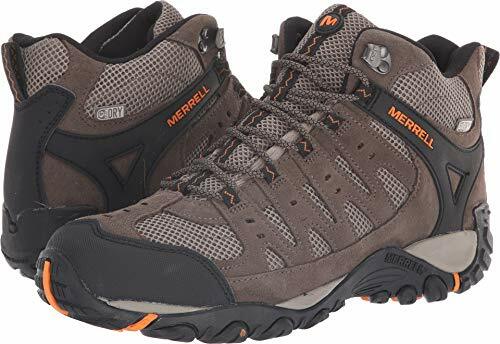 The Merrell Men's Accentor is one of the more comfortable hiking shoes available on the market today, and it is even stylish enough to wear every day. Additionally, it provides excellent traction and makes climbing steep mountains and hills even. It may be the ideal waterproof hiking boot for day hikers who plan to trek through wet terrains. The downside to any hiking boot that is not 100% leather such as the Merrell Men’s Accentor is always going to be the durability as textile may not hold up as well over time. However, most who have trusted this hiking boot for their hiking needs find it lasts for a long time without any issues developing. If you want a well-reviewed, trustworthy hiking boot that provides maximum comfort and amazing traction, then this may indeed be the best option for you. It checks just about every box there is, and it fits fantastic, allows for flexibility and comfort and perhaps most importantly you will never have to worry about slipping when trekking through wet areas and slippery rocks. The Vasque Men's Breeze 2.0 is made entirely of leather and is sure to keep your feet dry when out in wet areas of a hiking trail. Additionally, this hiking boot is also breathable, despite its waterproof design, and it keeps you comfortable during the entirety of your hiking adventure. With great reviews, quality design and protection, it indeed is a can't miss choice. There are a lot of benefits of the Vasque Men's Breeze 2.0. Perhaps most notably, it is incredibly water resistant due to its leather material and high cut design. This hiking boot also makes it easy to climb steep areas without slipping and is incredibly comfortable. If you are looking for a boot that performs well on the trail, the Vasque Men's Breeze 2.0 is the way to go. There are a few notable drawbacks to the Vasque Men’s Breeze 2.0. First off, it is one of the more expensive options on this list, although still affordable given the durability and overall quality. It is also mostly concerned with helping you perform well, so the style and fashion may not be more appealing than other options. If you want the best waterproof hiking boot for sale and price or appearance is not a factor, then the Vasque Men's Breeze 2.0 is perhaps the best choice you can make. It is sure to keep you safe while hiking in wet areas and you are sure to be much more comfortable throughout each adventure due to its comfortable construction. Whether you want a pair of waterproof hiking shoes and boots for long, multiple-day backpacking adventures, short day hikes or to wear recreationally regularly, you are sure to find what you need with one of these hiking boots for women. The Timberland White Ledge is not only one of the best hiking shoes for men, but the women's model is also a great choice as well. It is made entirely of high-quality leather, allows for excellent comfort and provides fantastic traction when climbing your way to the top of a steep mountain or trekking through wet areas of a hiking trail. The biggest upside to the Timberland Women’s White Ledge is the ability to use it for multiple purposes. If you simply want a comfortable hiking boot to wear around on a regular basis, go for short hikes with the family or spend several days out hiking and camping, you can stay safe, comfortable and looking great. It is near impossible to find a flaw with the Timberland Women’s White Ledge. The only drawback may perhaps be the weight, which is typically heavier than the average hiking shoe. However, this hiking boot still allows for extreme comfort and allows you to effortlessly travel miles through rough terrain without your feet becoming sore. The Timberland Women's White Ledge is made of the highest quality and reasonably well priced. 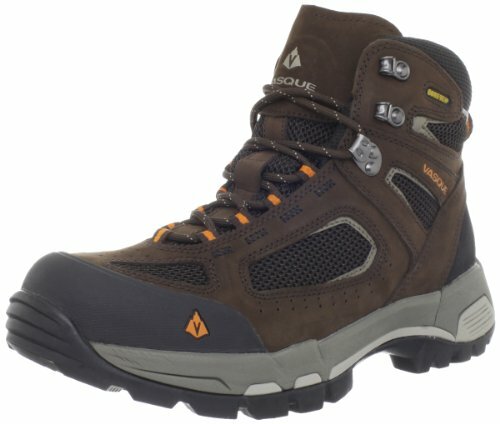 If you want the best all-around hiking boot, then this is a great choice to make. Thousands of women are currently wearing them and attest to the benefits they provide, and you are sure to get a pair you love when choosing the Timberland Women's White Ledge. 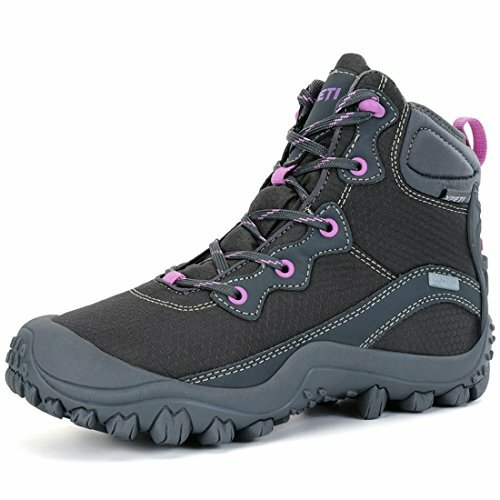 The XPETI Women's Dimo is a unique waterproof hiking boot as it is not made using leather material, which is the case with the majority of shoes. While this may scare some away, it allows the boot to offer benefits that others just cannot, and it is still very water resistant and able to handle wet hiking trails. The XPETI Women's Dimo is made of waterproof mesh and hydroshield membrane, and XPETI has found a way to make a hiking boot that does not contain leather. 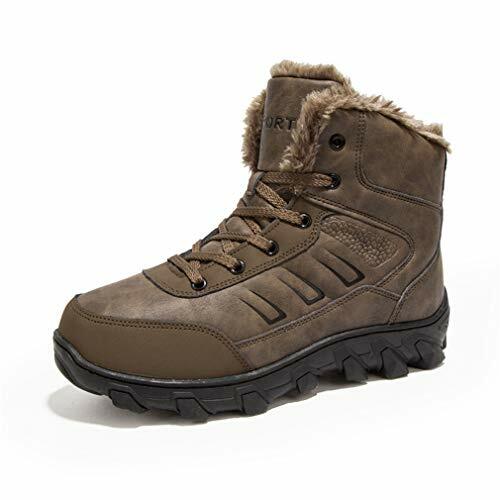 The most significant benefit of this is that it provides exceptional comfort, and many women consider it to be more attractive than leather-based waterproof hiking shoes. The drawback to not using leather - as is the case with the XPETI Women’s Dimo - is that it may not be as durable. If you only plan to use your waterproof hiking shoes for easy hikes than this may not be a concern, but it may not hold up as well when faced with more damaging obstacles, such as rocky surfaces. If you want one of the more fashionable hiking shoes that still performs well and provides exceptional ankle support and traction, then the XPETI Women's Dimo is an excellent choice. It is lightweight, includes comfortable insoles and meets all of the requirements to effectively keep you safe while trekking your way through wet and rough hiking terrains. The Manfen Women's Mid-Rise Hiking Shoes offers one of the more sophisticated designs of any women's waterproof hiking boot on the market. 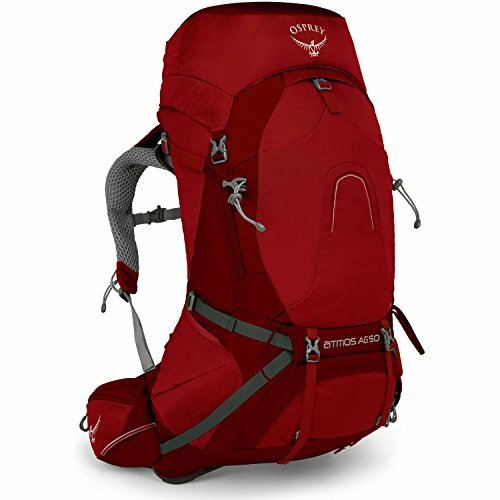 It is constructed to allow for maximum performance and safety on tough hiking trails that are hard to trek through. This option comes in six different models, including black, blue and camo in different arch supports. The most prominent benefit of the Manfen Women's Mid-Rise is its effectiveness on rough hiking trails. It provides ankle support that perhaps goes unmatched when compared against every other women's hiking boot on the market, and it has incredible traction and toe cap protection to keep you safe from slippery or sharp objects on the trail. The Manfen Women's Mid-Rise is a lot of boot, meaning it is high-cut and securely covers your entire foot and ankle. While this provides significant benefits such as ankle support and water-resistance, it can tend to get somewhat uncomfortable on hot days. Therefore, hiking in warm areas during the summer in the Manfen Women's Mid-Rise may not be the best idea. There may not be a better waterproof hiking boot for cold, wet areas than the Manfen Women's Mid-Rise. While it has its limitations and may not be ideal for warm weather climates, it is an excellent choice for early spring and late fall hikes - in addition to cold weather hikes during the winter time. The Manfen Women's Mid-Rise can keep you safe and performing well through any terrain. Columbia is a reliable brand, and the Columbia Women’s Dakota Drifter is one of their more popular hiking boots for sale. If you want a simple pair of waterproof hiking shoes for daily use or short hiking trips, then this is a high-quality, affordable option you have to consider. It is made of a combination of leather and fabric and works to keep you comfortable throughout each hiking adventure. Perhaps the most significant advantage when choosing the Columbia Women's Dakota Drifter is the affordable price, and it is one of the least expensive options on this review guide. It is perfect for simple day hikes in warmer climates as it provides a breathable design, while still keeping its water-resistant nature and allowing for excellent traction and ankle support. The Columbia Women's Dakota Drifter is ideal for short hikes and is attractive enough to wear in public regularly, but it is not suitable for longer hiking trips in which climbing steep hills or mountains is a priority. It is a merely waterproof hiking boot that can meet most hikers needs, but the more advanced hikers may need a more advanced pair of hiking shoes. The Columbia Women’s Dakota Drifter allows you to look good, feel good and perform well during day hikes, and it is perfect for anyone who is looking for a reliable pair of waterproof hiking boots on a budget. While it may not be ideal for cold weather climates, it works well to keep you comfortable when in warm weather. Are you planning to go hiking in cold conditions where snow is a possibility? These waterproof hiking shoes are built for snow, and they have certain features that allow them to perform better and keep you more comfortable while in cold rain or snowy conditions. There is nothing like fur snow boots to keep you warm, and the UBFEN Winter Warm Snow Boots are designed explicitly with fur and other high-quality material to allow for maximum performance and warmth when trekking through snow or incredibly cold conditions. 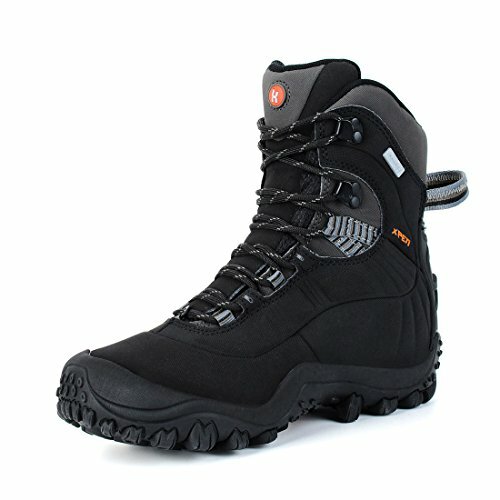 When hiking through snow, it is crucial to have excellent traction, which is undoubtedly provided by this hiking boot. The most significant upside to choosing the UBFEN Winter Warm Snow Boots is, of course, the warmth they provide in cold or even snowy conditions. Additionally, these boots are also very durable and made of high-quality material that can resist damage and withstand the test of time. From a performance standpoint, they offer excellent ankle support, traction through wet or snowy conditions and comfort. There are two downsides to the UBFEN Winter Warm Snow Boots. The first is the fur, which some men may not prefer from an appearance standpoint. 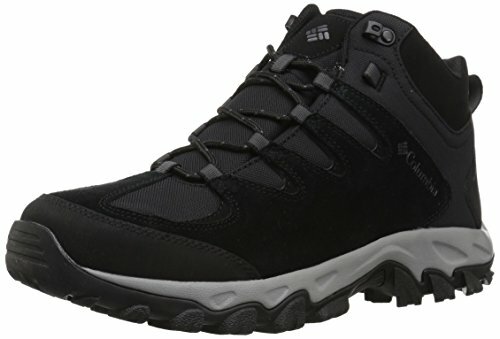 However, this hiking boot is built with performance in mind as is made to be incredibly useful. The second issue is with sizing, so be sure to know which size will fit you best before purchasing. There may not be a pair of hiking shoes that are capable of keeping your feet warm in cold and snowy conditions better than the UBFEN Winter Warm Snow Boots. It is an excellent option for those who frequently hike in cold areas where snow is a possibility, which is a time when a high-quality pair of hiking boots and overall safety is incredibly important. 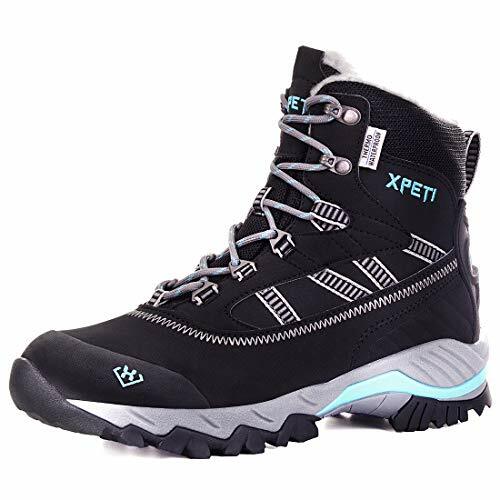 XPETI is a popular brand, and all of their hiking shoes are well designed, especially the XPETI Women's Oslo Winter Hiking Shoes. If you are searching for the best waterproof hiking shoes for cold or snowy conditions, then look no further. This pair for women is incredibly warm, provides excellent traction and ankle support and can endure potential obstacles experienced on the trail. The most obvious benefit of the XPETI Women's Oslo is the incredible warmth they offer when trekking your way through cold or snowy conditions. The secret to their success lies in their full fur insulation and the sophisticated hydrashield waterproofing system, which keeps water out and warmth inside the boot. It is also a great hiking boot for climbing through steep mountains and hills as well. The XPETI Women's Oslo is built for cold weather, and it may not be the most appropriate waterproof hiking shoes and boots for warm weather. Additionally, it contains little leather material, so it may not be as durable and long-lasting as several other options, although it should hold up well through even the toughest of terrains. If you are tired of your feet getting cold when hiking in snow or cold weather, then the XPETI Women's Oslo is the solution for you. It is very affordable and sure to keep you warm while on day trips or backpacking adventures. Additionally, it performs well and allows you to hike through tough terrains effortlessly. If you only plan to go on short day hikes, then a quality pair of hiking boots and shoes and a daypack may be enough, but it is essential to adequately prepare for long and more vigorous hiking adventures that take several days to complete. Be sure to assess your exact needs and determine what all is needed for the trip before leaving. Now you know exactly how to choose the best hiking shoes and have ten quality pairs to consider purchasing. As long as you know your exact needs and preferences and understand how to determine which pair is best, you can ensure you stay safe and can easily trek your way through tough terrains. Additionally, you can check out the rest of our gear to determine what other essentials you need before setting off to the trailhead. Hiking is a great way to get outdoors and experience nature to the fullest extent, so be sure to find a hiking trail near you or plan a trip to one of the best hiking destinations in your country. With proper preparation, your next hiking trip can be a fantastic adventure, and you can create memories that are certain to last for a lifetime. Angel Outdoors gives you inside access to the best outdoor hiking, camping, and backpacking gear. Every time you buy a product on our website, we donate 1% of our sales to food and water initiatives across the World. 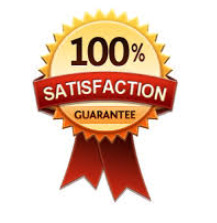 Want to purchase the best products? Angel Outdoors gear and outdoor equipment can be found on Amazon, eBay, and select outlets. Get Your Ultimate Outdoor Guide, Free! About Angel Outdoors: #1 best reviews of outdoor gear, sportswear, gadgets, equipment, apparel. 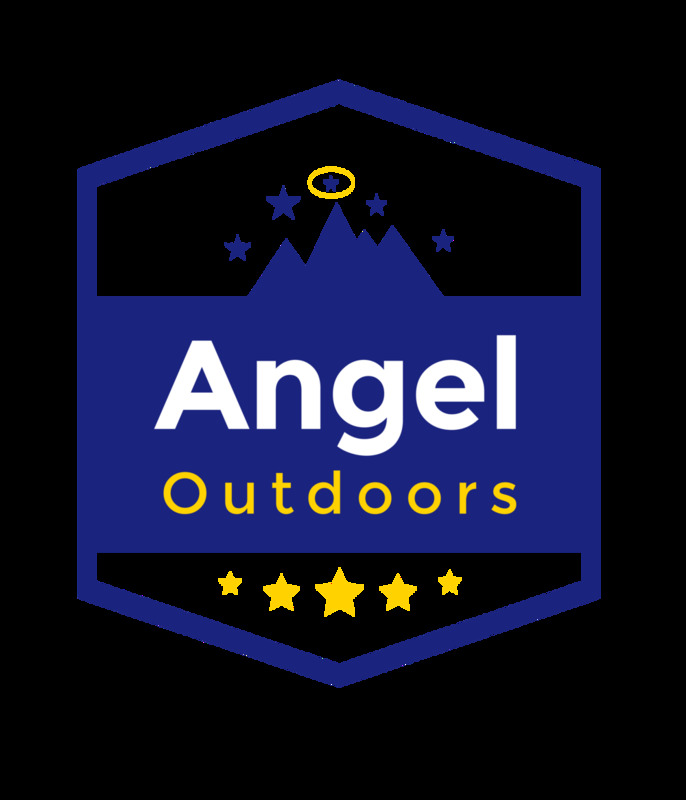 Angel Outdoors’ product experience review site gives you inside access and adventure guides to hiking, camping, backpacking, climbing, mountain biking, skiing, and running. We also discuss outdoor trips and trails that are ranked the best in the world for adventurers, outdoor lovers, and wanderlust travelers. This site was built by Vail Networks, the leading experts in web development for business.